Members are aware that Government of India while agreeing to infuse additional capital to Ten Banks , which according to certain parameters, have not been performing well, has advised such Banks as under. 1. Banks would be advised soon "plan of action" which will be designed by SBI CAPS for implementation by these banks . 2. There will be quarterly targets in different parameters to be achieved by the banks which would be monitored. 3. For the purpose , a Memorandum of Understandings need to be signed by the Managements, Unions and Department of Financial services. 4. Substantial reduction in operating expenses including staff cost. While advising our Federation as well as other unions, our Bank has indicated that some sacrifices may be called for from the work force - restructuring or suspension of some perks/ allowances which according to them would be restored after turn around of the Bank. Government has agreed to meet capital requirement of our Bank to the tune of 1150 core. Our Federation while responding to their above said communication made it clear that we were not in a position to commit any thing with out knowing the details of the conditions and until a common decision or guidance is made available from our apex body - AIBEA. However , at the invitation of managemnt the undersigned attended a meeting in Delhi on 20 th March, which was supposed and scheduled to be an 'informal inter-active session' with the members of the Board on the issues related to MOU. To our disappointment when we entered the meeting room no directors were seen or present except our CEO& MD , Both the EDs besides the GM HRM. We were also not able to get convincing answers for the change in the composition of the meeting. At the outset CEO & MD briefed the back ground and the necessity of the Memorandum of Understandings ( to be signed by unions, MANAGEMENT and government) and urged for the cooperation of one and all. Initiating the discussions the undersigned recalled the efforts made by our Federation in the last more than a year ,to impress upon the management for calling the meeting with unions with a sole purpose of working some strategies for re-energising the Bank and to put it in the path of recovery but the response was not forth coming . Similarly managemnt has created undesirable situation in the IR front by being mute to various important matters affecting the interest of work force thus pushing the unions to the path of agitation . Thus message to the managemnt were clear and loud that the morale of the work force is adversely impacted by the managemnt's inaction in several fronts and their representative Unions are placed in a situation that is not conducive to commit any thing. 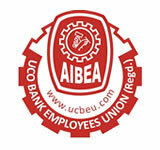 General secretaries of other unions - AIBOA, AIBOC & BEFI too were on the same page while placing their views. MD expressed that all should forget the past and should give a united face to the Givernment keeping in view the Bank's interest . To our expression that already the IR front is vitiated , MD expressed his endeavour to address all the concerns of the Unions . Thus the meeting concluded with a satisfaction that we could make our points in clear and louder way and make the managemnt to understand the sentiments of the work force. 1. While all pending VR requests have been cleared, declined requests when Re- submitted would be considered . 2. While 9 more appointments on compassionate ground are cleared, 18 pending cases are under consideration. Here again they have assured that declined cases would be considered upon resubmissions of requests for reconsideration. 3. Mile stone awards pending since 2014 - circular already released as demanded by us . Here after award will be as per the choice of the employees with in the limit of 2000 . Employees who have completed 25 years of blemishless service up to and as of 31/12/2016 would be benefited. 4. Regarding over time , necessary circular will be released upon receipt of board note which was approved in the board meeting on 20/3/2017. We , however expressed our disappointment and informed them that our demand for actual hours of work up to 31/12/2016 needed to be considered . 5. As per our demand , with the lapse of 14 months, management would meet the Unions in APEX LEVEL PERFORMANCE REVIEW COMMITTEE on 28 th March , during when plan of action for improving the health of the Bank would be in focus. 6. Clerical recruitment - drop outs in last batch, efforts are on to get the panel from IBPS for replinishing the gap. Managemnt is planning to recruit good number of clerks in the coming year. 7. With regard to issues that call for Policy decisions GM HRM expressed his desire to hold Policy committee meeting in the first week of April. Dude to our pure occupation we suggested to hold the meeting in the second or third week of April to which he agreed to advise the date soon. 8. Regarding medical reimbursement corrective steps are being taken . Undersigned and Secretary held discussions with Nodal officers of TPA and placed all the complaints. They assured to do the needful. Comrades, thus the six month old protest actions unleashed by our Federation, that culminated in to enthusiastic Dharnas before zonal offices and ultimately before HEAD OFFICE have brought out a desired change in the over all approach and attitude of the Management. Yet given the situation arising out of additional capital requirement and government desire to get an MOU signed by unions we can not remain complacent. We therefore call upon the units to keep the powder dry and be in readiness to counter any adverse situation by undertaking the MEET THE MEMBERS PROGRAMME when the units will enlighten all in general and the members in particular about the INDEPENDENT CAPACITY OF OUR FEDERATION TO LAUNCH STRUGGLE AND ACHIEVEMENTS THERE UPON simultaneously keeping them in preparedness to counter any adverse situation. Our deep sense of appreciation to all our units and Salutes to our members for the UN precedented response to our calls and success so far registered .